Happy sunday! This weeks challenge at the High Hopes Challenge blog is "Sponging". 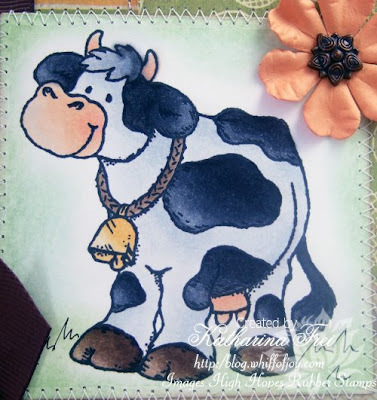 I used Maribelle the cow for my swiss greeting card. The sentiment is hand written and means "Greetings friom Switzerland". All the papers are from Crate Paper. I sponged their borders with a brown inkpad. Ich habe Maribelle die Kuh für meine schweizer Grußkarte verwendet. Der Text is handgeschrieben. Alle Papier sind von Crate Paper. Ich habe die Ränder mit einem braunen Stempelkissen gewischt. I coloured Maribelle with Copic Sketch Markers. The below photo shows which colours I used. I sponged the edges with SU pastels. Ich habe Maribelle mit Copic Sketch Markers coloriert. Das untere Foto zeigt welche Farben ich verwendet habe. She is very cute & the card is gorgeous. This is lovely, loved the way you DT girls put your cards together. Brilliant. Can so see why you had to have him. Just such a wonderful card. woww Katharina,what a beautiful card,l love the colours. Die Karte ist sowas von genial und die Kuh ist sowas von goldig und toll coloriert. Such a cute stamp and a great card-the stitching looks so perfect and the sponging suits the papers very much. I love this card! Your coloring is awesome as usual, but I really love the layout and the distressed layers!! I had fun with this challenge myself!! This is so cute!! I love this little cow!! So sweet! Fabulous card Katharina. Love that image, she's so adorable! Oh Katharina,das ist ja mal eine süße Kuh und natürlich wieder eine wunderschöne Karte. 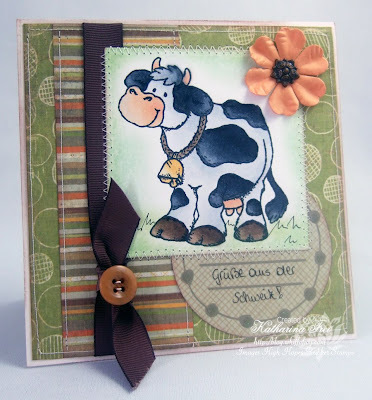 fabulous card Katharina, just love the sweet cow and those papers are scrummy!